TGIF LBI Lovers! Time for the weekend and a little rest and relaxation ‘down the shore!! If you get a little tired of all that sun, sand and surf (SAY WHAT??) here are a couple of interesting things going on this weekend around LBI~ Stay Cool! 8:00 a.m. until 2:30 p.m. on Saturday, July 22 with a rain date of July 23rd at the Waterfront Park located at 10th Street & Shore Avenue at the “Bayfront” in Ship Bottom by Vintage Automobile Museum of NJ. The show is open to all cars, trucks, customs, classics and hot rods. Exhibitor fee is $20 payable day of show; spectator admission is free. Under the directorship of Paragon Fine Arts Festivals, one of America’s premier organizers of fine art events, the LBIF Fine Art Festival weaves an exquisite tapestry of handmade original artwork from the talents of more than 80 local, regional and national artisans. Choose from original works in painting, photography, sculpture, metalwork, digital art and mixed media. Discover exquisite work in jewelry, glass, ceramics, woodworking – and much more. Enjoy a diversity of artistic styles within each art medium. Experience the opportunity to meet the artisans creating the work, learning how they became artists and your specific pieces made. Should you not find exactly what you seek, commission a piece of art made specifically for you! – Cedar Creek Cooking Co.
(Saturday 1pm – 4pm, Sunday 2pm – 4pm). Long Beach Twp. Police will be directing traffic for available parking on Long Beach Blvd. on Saturday & Sunday. Please do not park in front of neighbor driveways or mailboxes. Posted in Uncategorized | Comments Off on TGIF! Happy Saturday LBI Beachgoers! If you’re headed for Long Beach Island today, don’t let the traffic get you down, just take it easy and here’s the payoff when you get here…. Aaahhh. Safe travels, see you on LBI! 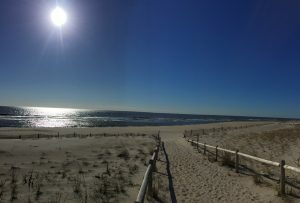 Posted in Uncategorized | Comments Off on Happy Saturday LBI Beachgoers! It’s a hot one on LBI! Hi LBI Lovers! Its a hot one with the predicted high of 87 and I think we’re just about there already! Enjoy cooling off in the ocean today with ocean temps still between 65-70 on our glorious beaches and a little warmer in the bay. It’s shaping up to be a great end to this week! DID YOU KNOW WE STILL HAVE RENTALS AVAILABLE FOR NEXT WEEK starting 7/15? Give us a call or submit a request form and we’ll have you here enjoying the sun and fun before you know it! Posted in Uncategorized | Comments Off on It’s a hot one on LBI!